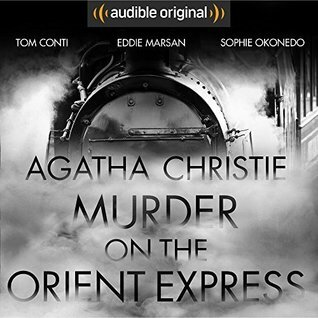 What begins as a routine journey on the luxurious Orient Express soon unfurls into Agatha Christie's most famous murder mystery. On board is the famous detective Hercule Poirot, and one man who come morning will be found dead, his compartment locked from the inside. This Audible Original dramatisation follows the train as it's stopped dead in its tracks at midnight. The tra What begins as a routine journey on the luxurious Orient Express soon unfurls into Agatha Christie's most famous murder mystery. On board is the famous detective Hercule Poirot, and one man who come morning will be found dead, his compartment locked from the inside. This Audible Original dramatisation follows the train as it's stopped dead in its tracks at midnight. The train's stranded passengers soon become suspects as the race to uncover the murderer begins before he or she strikes again. This all-star production features lead performances from Tom Conti (The Dark Knight Rises, Merry Christmas Mr Lawrence) as Hercule Poirot, Sophie Okonedo (After Earth, Hotel Rwanda and Ace Ventura) and Eddie Marsan (Sherlock Holmes, V for Vendetta and Hancock) plus a full supporting cast and even sound effects recorded on the Orient Express itself. Starring: Tom Conti as Hercule Poirot, Sophie Okonedo as Mary Debenham, Paterson Joseph as Colonel Arbuthnot, Walles Hammonde as Hector Macqueen, Jay Benedict as Monsieur Bouc, Jane Asher as Mrs Hubbard, Rula Lenska as Princess Dragonioff, Ruta Gedmintas as Countess Andrenyi, Eddie Marsan as Ratchett and Art Malik as the Narrator. Also featuring: Marie Rabe, John Chancer, Cedric Cirotteau, Andreas Karras, Barnabas Reti, Cristina Catalina, Greg Canestrari, Harry Hadden-Paton, Christope Delesques, Atilla Akinci, Hakan Silahsiz and Jeff Gerard.